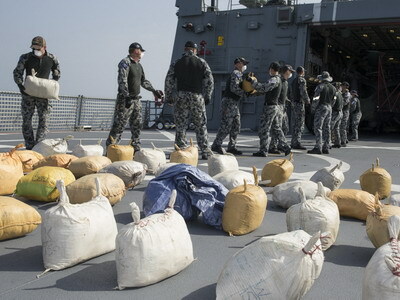 HMAS Ballarats boarding party lays out seized drugs. The Royal Australian Navy frigate HMAS Ballarat has seized more than 3.1 tonnes of hashish worth about AU$155 million during a boarding operation that took place between 8 and 9 January in the Arabian Sea. A dhow sailing in international waters was believed to be engaged in illegal activity when Combined Task Force 150 (CTF 150) of the Combined Maritime Forces (CMF) directed Ballarat to board the vessel and conduct a flag verification check, the Australian Department of Defence said on 13 January. Ballarat’s boarding team searched the dhow and seized the hashish. The drugs were transferred to Ballarat for disposal. Commanding Officer of HMAS Ballarat, Commander Paul Johnson, said the boarding team conducted the night-time boarding professionally. He said the team found the drugs hidden in voids around the vessel. “The seizure is a reflection of the continued trade in illegal narcotics which has the potential to fund terrorist groups across the region,” Commander Johnson said. Commander CTF 150, Commodore Darren Garnier of the Royal Canadian Navy, said the seizure would disrupt revenue supplies to terrorist organisations and was a good start to the new year. “As CTF 150 marks its sixth seizure in six weeks, our successes demonstrate the value of the coordinated efforts of the CMF international naval partnerships,” Commodore Garnier said. This is the third interdiction of narcotics by Ballarat since arriving in the Middle East in November last year on Operation Manitou. Ballarat seized more than 900 kg of heroin worth more than AU$279 million after boarding two vessels on 21 and 23 December 2018. Operation Manitou is Australia’s contribution to Combined Maritime Forces operations, a 33-navy partnership which promotes maritime security, stability and prosperity in the Middle East region.